Four-Stroke And Two-Stroke Internal Combustion Engines. 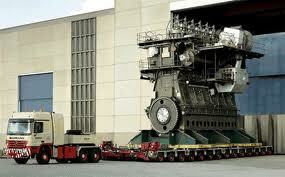 AutoGearhead: There are two types that an internal combustion engine to transform combustion into motive power. 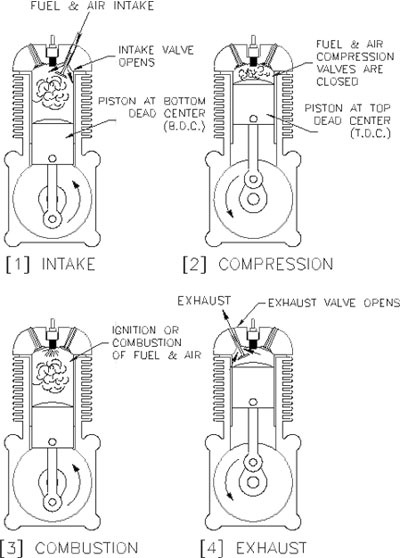 The two-stroke cycle and the four-stroke cycle engine. Two stroke engine produces power every crankshaft revolution, while a four stroke engine produces power once every two revolutions. Older designs of small two stroke engines produced more pollution than four-stroke engines. However, modern two stroke designs, like the Vespa ET2 Injection utilise fuel-injection and are as clean as four strokes. Large diesel two-stroke engines, as used in ships and locomotives, have always used fuel-injection and produce low emissions. One of the biggest internal combustion engines in the world, the Wärtsilä-Sulzer RTA96-C is a two-stroke; it is bigger than most two-storey houses, has pistons nearly 1 metre in diameter and is one of the most efficient mobile engines in existence. In theory, a four-stroke engine has to be larger than a two-stroke engine to produce an equivalent amount of power. Two-stroke engines are becoming less common in developed countries these days, mainly due to manufacturer reluctance to invest in reducing two-stroke emissions. Traditionally, two-stroke engines were reputed to need more maintenance (despite exceptions like the Ricardo Dolphin engine, and the Twingle engines of the Trojan car and the Puch 250 motorcycle). Even though the simplest two-stroke engines have fewer moving parts, they could wear out faster than four-stroke engines. However fuel-injected two-strokes achieve better engine lubrication, also cooling and reliability should improve considerably.